Where I live, heavy rains have curtailed most outdoor activities today so I am indoors catching up on things that I have postponed...like the latest Archer episodes and other mindless pursuits. I did plan to start a MofW kit but when I reached into the closet I found a pile of blotters instead. If you don't know what a blotter is let me harken to the days when the Sisters of St. Joseph walked into the classroom and said, Kennedy's been shot, the Cubans are invading...get home. All I could picture was getting to Princeton Ave, and dodging the Cubans on the way home but I digress. Blotters were used to control the flow of ink from your fountain or cartridge pen...back in the days when we wrote letters with real ink and real paper. Businesses, taking advantage of this phenomena; advertised their service, the railroad industry being no exception. Take a look at one of my favorite blotters from the early part of the 20th century. It is sad that not one of the connecting railroads exists today, but the Alton and Southern still exists as a wholly owned subsidiary of the Union Pacific Railroad. Finally, remember when there were passenger trains...before Amtrak. Here is one of the forgotten railroads when it was still a "player"
Speaking of F unit locomotives, we have taken in a couple of large collections of Lionel Trains at the Big Little Railroad Shop. Lionel made a good living selling F units and continues today to re-issue the ever popular EMDs. Stop by to take a look at our used trains and if you have been looking for a particular train for a long time, we probably will come across it sooner or later. We also carry lots of the latest trains issued by the Lionel, MTH, Athearn, F&C and also have the latest in Division Point Brass including exclusive L&HR and CNJ RS3s. Look no further than Somerville NJ to meet all of your hobby needs. All across the nation, there are record numbers of 90+ degree days with no real relief in sight. This makes it tough for railroads and railfans alike. So, find some water and take it with you just like real railroaders if you're out their "fanning". Speaking of real railroads, check out this report from Norfolk Southern which addresses efficiency. We all know that the railroads are an efficient form of land transportation, if not the most efficient, but efficiency takes all sorts of forms in the corporate world as you will see in this report. http://nssustainability.com/, Railroads are more than just a paint scheme! Finally, if you really want to escape the 90+ degree weather and watch trains at the same time I would suggest North Dakota. The daytime highs average in the 80s and nightime lows average in the mid 50s. 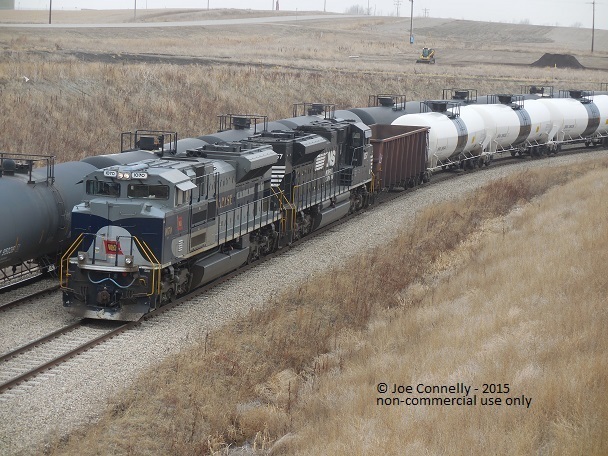 While working in New Town ND I caught this Wabash Tribute locomotive coming from the oil fields and headed to the east coast with 100 cars in tow and a buffer on each end. Speaking of buffer cars, (shameless plug to follow) we received our new Tangent Models order and their buffer cars are really nice and mirror the protoype exactly. By the way, for you rail historians, when the song Wabash Cannonball was originally published, the Wabash Railway did not have a "Cannonball" name train. The original music was published in 1882; the real train however did not appear until 1949, as a Detroit to St. Louis daytime express. The song, by the way, is part of the The Rock and Roll Hall of Fame 500 songs that shaped Rock and Roll...How about that. So, here we are in the dog days of summer but do you have any idea how the dog days of summer came about. Sirius,(not the satellite radio) is also known as the Dog Star, because it is the chief star in the constellation Canis Major, the Big Dog. Sirius, in late summer, appears in the east before sunrise close to the sun so when the early astronomers saw this very bright star and the sun rising at the same time, they imagined that this was the cause of hot weather of August, thus the dog days of summer. Speaking of Sirius XM, the dog in their logo does have a name. Do you know the name of the dog? Give the correct answer and we will draw at the end of the month for the PEZ dispenser of your choice. The winner will be posted on the blog in early September. As hot as the weather as been in the central NJ area, you are a better person than I am if you are out watching the railroad. The railroads have figured out that if you paint the roof of the cab white, it lowers the cab temperature by 20 degrees but its still hot out there. Me personally, I'd rather be indoors reading a book about railroading and if you are so inclined, take a look at some of the books we have for sale on Alibris at http://www.alibris.com/stores/tblrrs63?slr_ref=tblrrs63 I am certain that something will appeal to you and you can pick it up at the store if you're close by. We have taken in hundreds of books and are just a little slow getting them all listed. Our photo today comes from Kermit Geary Jr. The last time I saw Kermit was at Parsons Yard, Columbus, OH when I was still working for FRA. I admire Kermit for his dogged determination on photographing every single locomotive in the country, even the ones that aren't running anymore. 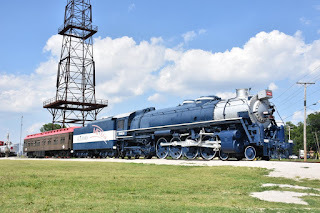 Here is a big "FRISCO" Northern in Tulsa OK when Kermit was getting his kicks on Route 66.